It’s about time to start planting seeds indoors for outside growing after the danger of frost. Where I live, that is usually Mother’s Day, around May 10. But before you start, check your potted plants for any volunteers that have hitchhiked in that soil. If you replanted in previously-used soil or had plants sitting close together, you may already have plant starts growing. Although I love having fresh, homegrown tomatoes, I don’t grow tomatoes from seed. They tend to take matters into their own seeds and sprout all by themselves and, this year ,they are right on schedule. Over the years, I grow tomatoes in pots on my deck. 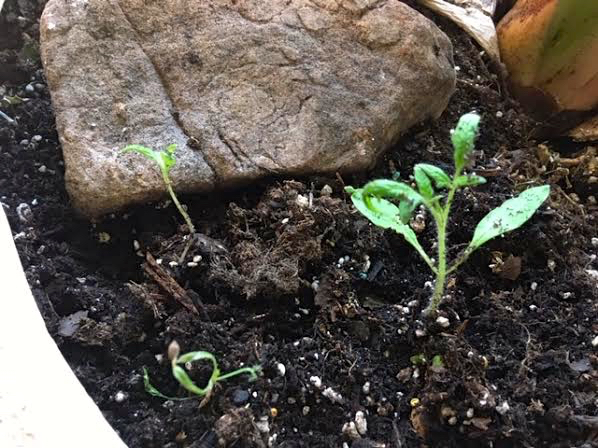 The seeds end up in neighboring pots and tend to start growing on their own late winter. This year, I found the tomato starts in a potted banana tree. The tomato seedlings don’t show up all at once. The first one is now sitting in its own pot, crushed eggshells in the bottom and coffee grounds mixed up in the plain potting soil, no added fertilizer. This way I can control how much fertilizer is going into the soil. After noting the first tomato plant, I started to check the soil for any other arrivals. Sure enough, more tomato plants are showing up so I will be potting those as well. I let the little seedling get established before I move it and I take a whole glob of soil around the roots so that it has the least amount of trauma making the move. When I see these seedlings, I can’t help but think of my Vegetables Baby Quilt with talking tomatoes. This is gardening at it’s easiest. How many of us overlook those seedlings by pulling them out or piling rocks on top of them?